I haven't played with a Bugaboo Stamps image in a while and today seemed a good opportunity to play in their Catch the Bug "Spring" challenge. I've had this fun image for so long but I can't remember ever using it so... I'm not sure if the cat is chasing the bird or if the cat is protecting his seed pots but either way, I thought it made a great image for spring. :-D Hmmm, maybe the bird is chasing the cat? I also used the sketch from Bugaboo's Stella Says Sketch. 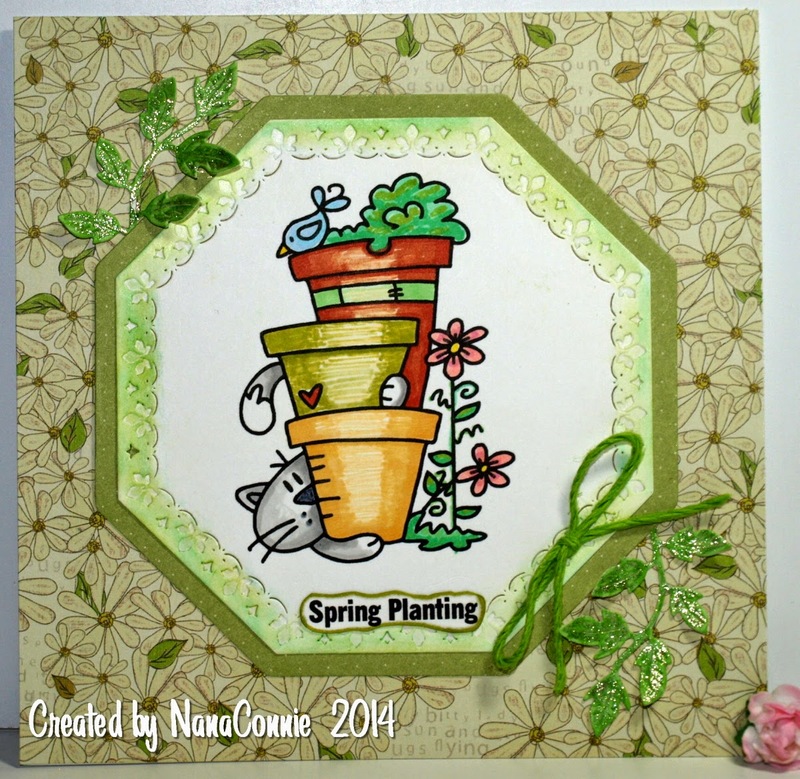 I used ProMarkers to color the image and then die cut it with a Spellbinders die. I used a plain octagon die (QuicKutz) to cut a mat for the image. I used chalks to highlight the embossed edges of the image. The leaves were cut with a Cheery Lynn die and I added some ultra fine glitter to them to give them some sparkle. The background dp is from the Loolah stack by Iron Orchid and that stack has been hiding in my stash for more than 2 years! It was one of those I bought because I just 'had to have it' and have never used a single page of it. Now I can give up my guilt trip over that since I've used a sheet of it now. And it's a sheet I really, really love! My final touch was the Baker's Twine bow. Such a darling image and I love the leaves, papers and bow also. Sweet card, Connie. Have a great day. I LOVE this image, Connie. Oh, gardening sounds great. I have more to do, too. Adorable card! Great coloring of the fun image too. Connie, this is gorgeous, I do love the image and beautifully coloured too. Love the sparkle on those leaves and the precious image - that's colored so lovely. Framed out to perfection and a lovely card! A sweet card Connie, wonderful colouring and those sparkly leaves and your pretty paper and bow - perfect for the image! Hope spring is here at last - Happy Easter. This is so pretty, Connie. I love that border inside the octagon. How did you do that? Such a cute kitty- that is colored so wonderfully- and looks like he is protecting the pot. Love the die cut and the cute frame inside of it. Lol! Great card fantastic little image, beautifully coloured! I love your take on the sketch too! Very beautiful, Connie! I love the garden cat images, he's so full of mischief! Thanks so much for joining us this week for the Catch the Bug Challenge! Hope to see you again! Love your image - now I have another must have Bugaboo image to add to my collection :-) Beautifully colored. OMG this is a fabulous take on our Stella Say Sketch challenge - thank you so much for sharing it with us! What a lovely card! Sweet image too. Thanks for playing with Hobbybook. Those pots are soooo cute, NC. And look at kitty peeking from below! such a great card and perfect for our challenge, thanks for sharing with us at Crafty Catz and showing an interest in the gdt. Happy Easter. I'm back with my DT hat on - You know I love your card, NC. Both Kitty and Birdie are perfect for our Animal challenge. Thanks for playing with us at PolkaDoodles. Connie, this is adorable. Love your coloring and that image is too cute. Thanks for playing along with our spring challenge at Catch the Bug. Thanks for entering your lovely creation over at Bugaboo's Catch the Bug for our Spring themed challenge this week. We hope you join us again soon! Love this card and image, can't wait till one can actually get out there and plant. That means late May for me! Too cute!! Thanks so much for joining the Stella Says Sketch Challenge at The Bug Blog with Bugaboo Stamps. We hope you'll join us again and play along! Min - Bugaboo Stamps Asst. Design Team Coord. Such a cute image and great colors. Lovely card! Thanks so much for playing with us again at A Creative Need, Connie! Thank you for joining us at Craft for the Craic.